In the last three weeks the story of Ahed Tamimi, a 16-year-old prominent Palestinian activist resisting to the Israeli occupation of her village in the occupied territories and who was arrested on December 19th, has become one of the most debated topics regarding Palestine in recent times. In the middle of the night she was taken from her house by the Israeli army and arrested after a video that was posted on Facebook by her mother Nariman showing Ahed with her cousin Nour slapping an Israeli soldier. In a few hours the video became viral and attracted attention from all over the world. She was charged with many allegations, among which the most serious ones include “threatening a soldier, attacking a soldier under aggravated circumstances, interfering with a soldier carrying out his duties, and throwing objects at individuals or property”. Her mother was also charged with incitement for streaming the video on social media as well as for assaulting soldiers. Later on, other two women from the family were arrested, her cousin Nour who was with Ahed in the video and her cousin Manal while protesting the detention of her relatives in front of Ofer prison. However, both in Israeli and international media almost no coverage has mentioned the prior event to Ahed’s arrest: another cousin, Mohamed Tamimi, a 14-year-old boy, was shot in the face with a rubber-coated steel bullet few days before, on December 15th, during a demonstration against the US decision to recognise Jerusalem as the future Israel’s capital and he remained in an induced coma for several days. The Tamimi family is not stranger to such arrests and detentions since they represent a well-known example of the Palestinian popular resistance movement, as also featured on the cover of the New York Times Magazine already in 2013. Their village, Nabi Saleh, is surrounded by the illegal Israeli settlement of Halamish, that is largely stealing natural water resources from the Palestinian land. Along with other villages around the West Bank such as Bi’lin, Ni’lin and Budrus, Nabi Saleh has become the core of the Palestinian resistance struggling in opposition to the establishment of further Israeli illegal settlements as well as the construction of the Wall in the occupied Palestinian territories. In particular, in the last decade, a popular campaign of resistance coordinated by the Palestinian Popular Resistance Committees and founded on nonviolence and civil disobedience has turned into a powerful political challenge to the occupier. Although in the beginning of these protests male-dominated leaderships took the scene, women’s role has significantly increased both individually and as a collective political group. Ahed Tamimi is one of them. In addition, she has also become the symbol of a new generation of Palestinian activists who have spent their entire life under the Israeli military occupation and the false myth of the so-called Oslo “peace process”. All around the world this story has polarised public opinion and has created strong reactions. 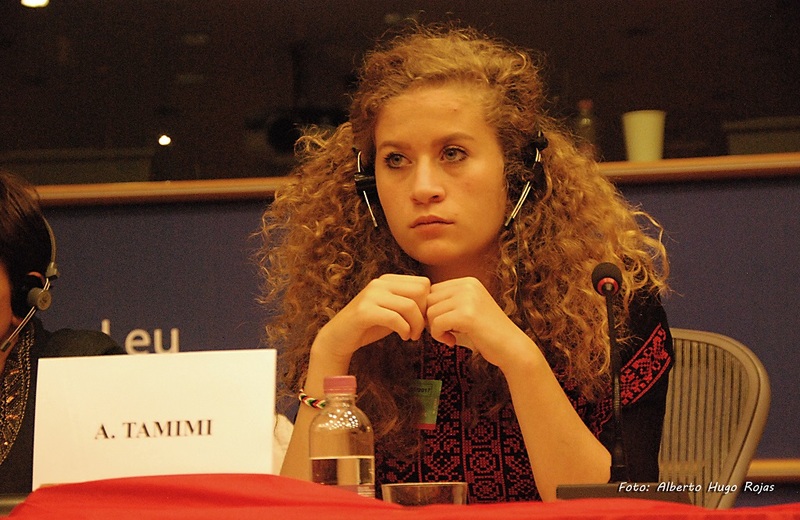 In many countries, pro-Palestinian supporters together with common citizens have publicly shown solidarity with Ahed, her family, her village and the Palestinian people as a whole. Moreover, the focus on such arrests has also been used to draw attention to the broader situation of thousands of Palestinian prisoners in Israeli jails. According to the most recent statistics provided by the Palestinian non-governmental civil institution Addameer in November 2017 (Prisoner Support and Human Rights Association), Israel was holding more than 6,000 Palestinians in its prisons, including 250 children. On the other hand, cases of incitement and propaganda against the Palestinians have continued to take significant place inside Israel by increasing public declarations and actions in order to dehumanise and demonise the Palestinian people, up to describing Ahed Tamimi as a terrorist. Nevertheless, targeting in such a way the Palestinians in general, and the Palestinian grassroots activists in particular, strengthens even more the Palestinian commitment to the popular struggle, to sumoud (steadfastness). Ahed Tamimi, as many other young people in the West Bank and in the Gaza Strip, will not give up, she will continue her struggle to achieve freedom and justice for all Palestinians.